Supreme Court grants Little Sisters of the Poor cert on ACA. Is opting out of part of the Affordable Care Act a religious burden? 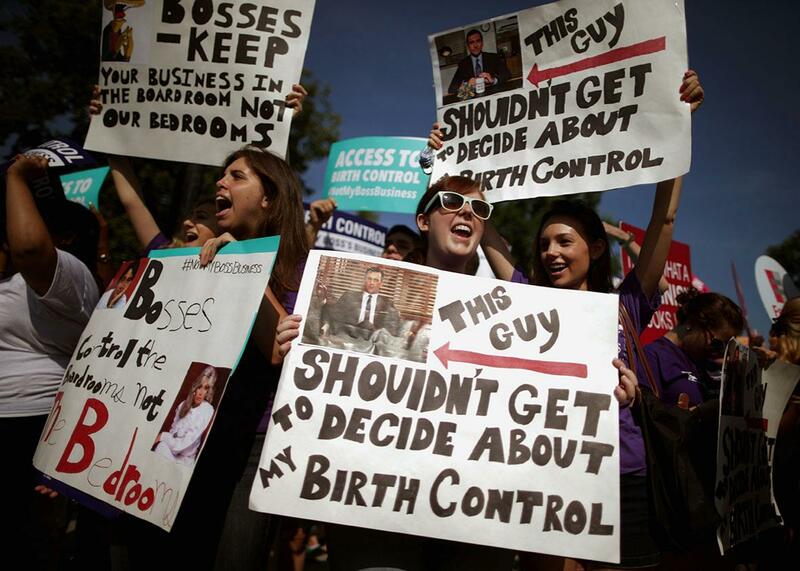 Supportes of employer-paid birth control rally in front of the Supreme Court before the decision in Burwell v. Hobby Lobby on June 30, 2014, in Washington. Uterus is back on the menu at the Supreme Court, with the justices announcing Friday that they will hear a challenge to the Obama administration’s compromise accommodation for religious institutions that object to providing birth control to their workers. The question—left dangling after the court’s 2014 decision in Burwell v. Hobby Lobby—is whether the compromise offered to religious employers might violate their religious freedom as much as the arrangement it attempts to circumvent. The Affordable Care Act requires that employers provide a variety of birth control methods, at no cost, as part of their preventive health care benefits. In Hobby Lobby, the court held by a 5–4 margin that the owners of for-profit, nonreligious businesses who have religious objections to certain forms of birth control could decline to cover those items in their employer-provided health plans. When the Hobby Lobby majority brushed off the health needs of the nonreligious employees, one of its rationales was the existence of a workaround—an alternate method to cover birth control—that the Obama administration had already made available to religious nonprofits. But religious nonprofits immediately began to claim that even filling out the form was a religious burden. This claim has garnered very little traction in the courts of appeals, losing in the seven that had heard cases, as judges ruled that the “opt out” plan simply did not put a “substantial burden” on a religious group’s freedom of religion. That pattern held until September, when a panel of the 8th U.S. Circuit Court of Appeals accepted the religious nonprofits’ argument that it would violate their religious conscience if they had to notify the government of their religious objections, as that act itself would “trigger” the provision of what they believe to be an abortifacient for women. Judge Roger Wollman, writing for the court, found that the objectors “have a sincere religious belief that their participation in the accommodation process makes them morally and spiritually complicit in providing abortifacient coverage. Their affirmative answer to that question is not for us to dispute.” Once the 8th Circuit weighed in on the side of the religious groups, it created a split among appeals courts that made it virtually impossible for the Supreme Court to stand by any longer. Seven cases were brought by religiously affiliated schools, hospitals, and charities, all of which decline to fill out the form under the federal Religious Freedom Restoration Act. The Supreme Court agreed to hear them together, including a challenge brought by the Little Sisters of the Poor, an order of Catholic nuns that runs nursing homes. In a petition to the court, the order claimed that the nuns believe that the opt-out form offered as a compromise to religious objectors “would make them morally complicit in grave sin.” The nonprofits want to be treated like churches and exempted from the need to provide these reproductive services in the first instance. In addition to being the fourth major challenge to Obamacare to be heard at the Supreme Court, the seven consolidated cases also become an emblem of what is sure to be one of the biggest themes of the coming years at the court: the clash between religious freedom claims and the rights of secular Americans. As Linda Greenhouse argued last week, the challenge for the court in this case will be to determine whether protecting the freedoms of religious Americans—untethered from any scientific, medical, or factual predicates—will be elevated to such a degree that the rights of nonadherents will begin to evaporate. The court has taken up the call—echoing back to the first moments after Hobby Lobby was announced—to clarify whether any claim of religious conviction, if deeply held, can overcome the rights and needs of third parties. As the Center for American Progress recently reported, religious liberties claims are being used ever more frequently as a way to seek broad exemptions from civil rights laws and to justify acts of discrimination. In his Hobby Lobby concurrence, Justice Anthony Kennedy announced confidently that nothing of the sort was possible as a result of that decision. We will know by the summer if this is so.